Before I arrived in Mumbai I had been given lecture upon lecture about the danger of scammers and dodgy dealers who will accost me as soon as I leave the airport. But, not only are there giant signs all over the airport telling you that you must not go with any taxi other than the government sanctioned prepaid taxis, but there were no hordes. No seething masses standing around outside the airport. If anything, the airport felt far less frenetic than JHB international. But, at the suggestion of others, I had arranged a car to collect us and take us to the hotel we were staying in just outside Mumbai central near Juhu beach. Ironically, the taxi that fetched us seemed far less professional than the taxis waiting at the airport and ended up costing a fortune in Indian standards. That said, it is a well known fact that taxi and rickshaw drivers can spot first time visitors to India immediately with their keen eyes. 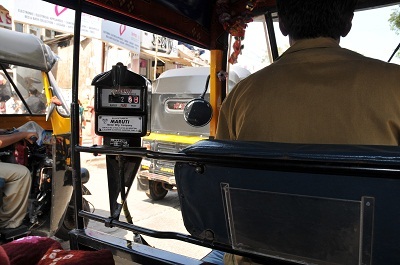 Obviously this is made particularly easy if you have white skin, but even Indian visitors to the city are taken advantage of by the quick thinking drivers looking for a few extra rupees. As a foreigner, you’re pretty much going to have to get used to paying at least double the metered price. And really, who can blame them? When a taxi would cost a local Rs 15 and you pay Rs 50 – what difference does that really make to you? R3 or R10 split two ways? It seems petty to try and haggle at every turn and sometimes it’s best to let it go. If you think you can afford the price, even if you are getting ripped off by the locals, then why not? After all you are in a hugely overcrowded country with millions of people living on next to nothing each month. That said, always agree to a fare before getting into any taxi otherwise you might be royally ripped off, which doesn’t feel very pleasant. In any case, our polite driver is waiting patiently with a handwritten sign. We spot each other and he quickly walks off towards the dark recesses of the car park and we are hardly able to keep up with him. We feel immediately suspect, especially as this pathway takes us over a drain from which emanates the infamous Mumbai stench – thick, sweet sewage. And so we stop and wait. Thinking that maybe we should go back and get a prepaid taxi. Suddenly he comes running, gesturing us onwards and we find his air-conditioned car waiting. We get in and I prepare for my first taste of the mayhem of Indian roads. Again, this is something often talked about by visitors to India. But nothing can quite prepare you for the pace and the perfectly timed squeezes – mere centimetres – as auto rickshaws, taxis, cars, trucks and people weave their way through the streets. It’s an organised chaos. Each individual absolutely confident of the point that their vehicle ends and another begins, and they stop, start, swerve, and scream along the potholed roadways. Hooting constantly. It’s madness. And everyone is Indian. Sitting in the relative luxury of our air-conditioned ferry, rickshaw drivers and passengers stare openly at our pale flesh, so strange amid the beautiful and smooth brown skin of the women and men of Mumbai. The Iskcon Hare Krishna temple, only 5 minutes walk from the beach, was a welcome relief from the hot streets. While the prices are extraordinarily high compared to other Indian hotels, we were glad of the clean, comfortable room and functioning aircon. As an active temple, there are constantly religious ceremonies taking place in a beautiful and peaceful marble courtyard. “Hare Hare Krishna. Krishna Hare” mingles with the smells of incense, the clanging of bells, the steady beat of drums and the voices of Hare Krishna followers as they pray, dance, sing and clap hands. The vibrant colours of the traditional saris, mix with chains of marigolds and daisies and the orange and white robes of the Hare Krishna gurus.